Read about 10 picture perfect places at Ewing Cultural Center. To many it may look like a castle. Others may see a mansion. The European-style home at the Bloomington corner of Emerson Street and Towanda Avenue is neither. It is the former country manor of chewing gum heiress Hazle Buck Ewing turned world traveler, philanthropist, and pioneering activist. The manor will celebrate its 90th anniversary with free tours on September 27. Named for the couple who built it—Hazle Buck and Davis Ewing—the manor is best known as home to the annual Illinois Shakespeare Festival. Performances have been held for 41 years on the manor’s six-acre grounds, collectively called the Ewing Cultural Center. The 90-year-old home was bequeathed to the Illinois State University Foundation upon Hazle’s death in 1969. The Foundation board maintains the property, which remains vibrant because of dedicated volunteers. They work under the direction of Ewing’s facility manager, a position held by several dedicated Foundation employees over the past two decades. The job has been in the hands of Toni Tucker for the past six years. Related Gallery: Holidays at Ewing Photos of the Ewing Cultural Center's 2015 holiday decorations. Tucker approaches the home as a collection of historic treasures: dusting weathered edges, unearthing secrets, and cataloging her findings. She is as fascinated with Hazle and Davis as she is the home. A woman of high culture, Hazle was chauffeured in her Cadillac to see opera in Chicago. 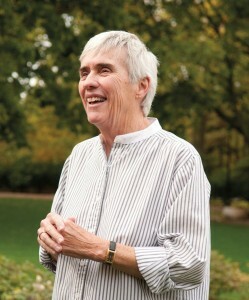 She had a lifelong dedication to charity, becoming a benefactor of schools and students. She was also mother to two sons she and Davis raised. Toni Tucker, Ewing’s facility manager. Politics were important to Hazle, who became immersed in the women’s suffrage fight. Her home was an appropriate setting to meet with dignitaries, such as her cousin Adlai Stevenson II, as it looked like it could have been plucked out of the English countryside. The Channel-Norman design is based on homes the Ewings visited in England and France. 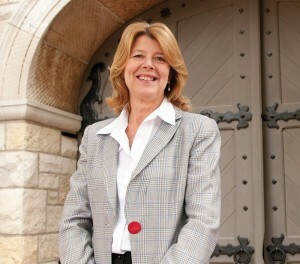 The appearance is largely the same today through preservation efforts that please Ewing’s granddaughter, Cindy Buck Ewing of Santa Fe, New Mexico. She and Tucker had a fortuitous meeting in the manor’s courtyard in May of 2012. Cindy was in Bloomington to attend a Miller Park Zoo meeting. She sits on the zoo board due to another Hazle bequest. Tucker gave Cindy a tour of the home, sharing the dream of restoring the manor to the look of yesteryear. Cindy as well as two other grandchildren—Ted Ewing of Iowa, and Sandra Ewing Warner of Tuscon, Arizona—agreed to partner in the project, noting family members have many manor treasures. They have since been returning mementos inherited after Hazle’s death. Among the treasures are an elegant umbrella stand, paintings, an English oak dresser, and the original travelogues Davis wrote of the couple’s around-the-world trip. Cindy Ewing is a granddaughter of Hazle and Davis. “Our advantage is we have so many of the original pieces, and right now I have what I call a primary source person who was here and talked to Hazle, who knew her and knew her wishes,” Tucker said. She in return shares treasures Cindy has never seen, such as what is believed to be the Ewings’ only surviving wedding announcement found in an old desk. The document is a memory from happy times for the couple, who were raised in wealthy homes. Davis came from a prominent Bloomington family. His father was an attorney and U.S. minister to Belgium for President Grover Cleveland. Davis formed a concrete company that laid Bloomington’s first streets and sidewalks. Hazle was born in Cleveland. Her father bought a fledging chewing gum company, perfected the recipe, and merged with Wrigley. In return he received 49 percent of Wrigley’s stock and a position on the board of directors. The couple met at a Christian Scientist gathering in Chicago, where Hazle’s family had relocated in 1881. They married in 1907 and moved to 1522 East Olive St. in Bloomington. They eventually took in two boys: Ralph, who is Cindy’s father; and Nelson, who is Ted and Sandra’s father; was embraced like a son but was never officially adopted. Only Nelson grew up at the manor, which was built on 60 acres the Ewings bought in 1923 in an undeveloped part of Bloomington. Ideas for the home were gathered when the couple and Ralph journeyed around the world in 1924-25. Many of Hazle’s trip souvenirs, mostly Asian art, decorated the manor designed by architect Phil Hooten as the main feature on the Ewing estate named Sunset Hill. 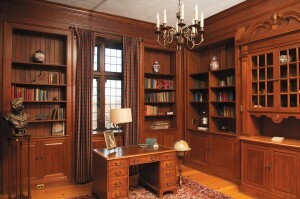 The library at Ewing Manor remains an inviting room, with built-in bookshelves that are made of hand-rubbed walnut. The desk belonged to Hazle Buck Ewing, with many of the books on display owned by the Ewing and Buck families. The surrounding property was designed by famed landscape architect Jens Jensen. He used Hazle’s selection of native plants, including bluebells, to lay the foundation for what is now the Genevieve Green Gardens. The manor was built mostly of concrete by local contractors, supplied with materials from the Midwest, and took 18 months to construct at a cost of $178,000. The home has buildings with north and south exposures, allowing air to circulate. There are 44 rooms, including the family’s living quarters. The main section is three stories. It is large but feels cozy due to compartmentalization and choice of building materials: wood, iron, and stone with slate, wood, and brick floors. The ground floor includes a library, living room, dining room, and kitchen. The second floor held all five of the home’s bedrooms. The top floor was highlighted by an office for Davis with exposed brick and commanding views of the property. He enjoyed a chemistry lab and photo darkroom in the basement, which was designed to accommodate up to 100 visitors. There are two wings. One has a stable and carriage house, the other an apartment where the help lived. The whole estate is an interconnected maze with hidden nooks and crannies. The manor’s exterior has a castle-like feel that is accentuated by an interior courtyard; two archways, created by extensions from the main section to the wings; and two turrets, one of which functions as a lobby and as space for a winding staircase that provides access to the main wing’s three stories. The home’s quaintness includes the fact each light fixture is unique. An intercom system Hazle used to communicate with five household employees is still in place. The spiral stairway, right, rises up three floors. 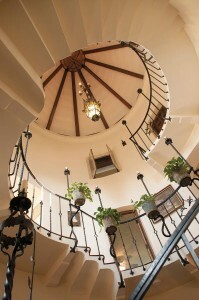 The wrought iron railings and candle fixtures were custom-made for the home. The stairs are concrete. “It is very homey,” said Tucker, who delights in hearing the memories from Hazle’s grandchildren that make the manor come to life. Cindy knows which shower always leaked. She remembers joining her cousins in singing from the turret’s staircase to their parents one Christmas. Hiding with her cousin inside the residential wing’s luggage elevator was quite the childhood adventure, as was learning from her grandmother how to ride a horse at age 4. “I had a great role model,” Cindy said of Hazle, who was a University of Chicago philosophy graduate. Hazle made her mark as an activist and philanthropist. She paid for local girls to attend college; founded Victory Hall, a home for boys; and started the School of Nations at Principia College. Her activism ranged beyond women’s rights into ecology and supporting the League of Nations and the United Nations. No matter how far she traveled, Hazle always returned to the manor. Over the years, Hazle began selling pieces of the property. The original plans called for 10 other manors to be built, but more modest ranch homes were instead constructed along Sunset Road. Residents of that neighborhood remain actively involved with the manor. They enjoy meeting Cindy for conversation and potlucks at Ewing when she visits Bloomington. The hospitality continues a tradition of outreach established by Hazle, who was a fixture in the neighborhood. She welcomed new neighbors and allowed their children to ride horses with her and use her tennis courts. “She really loved the community,” Cindy said. Now used primarily for meetings, retreats, and weddings, Ewing Manor is increasingly an academic gem as well. Faculty engage students in everything from historical research to a setting that challenges art students. The manor also continues to embrace visitors. “This community loves this home,” Cindy said, which explains why tours are popular, as are special events such as trick-or-treating for children. The outreach pleases Cindy, who affirms Hazle would be delighted that a welcome mat is firmly in place at her beloved manor. Learn more about Ewing Cultural Center at EwingManor.IllinoisState.edu. To inquire about hosting a wedding or event at the property, call (309) 438-6333 or email Ewing@IllinoisState.edu. See more photos from inside Ewing on Illinois State’s Flickr page. I just love the staircase. It`s so beautiful!